Brace yourselves for an incredible journey to outer space and attempt to find the Event Horizon, a place where magical things occur day in day out. While you need to be careful not to go past the point of no return, should you stay close to said boundary, you will witness some amazing phenomenons, such as Sync Reels that do not normally happen in your everyday world. 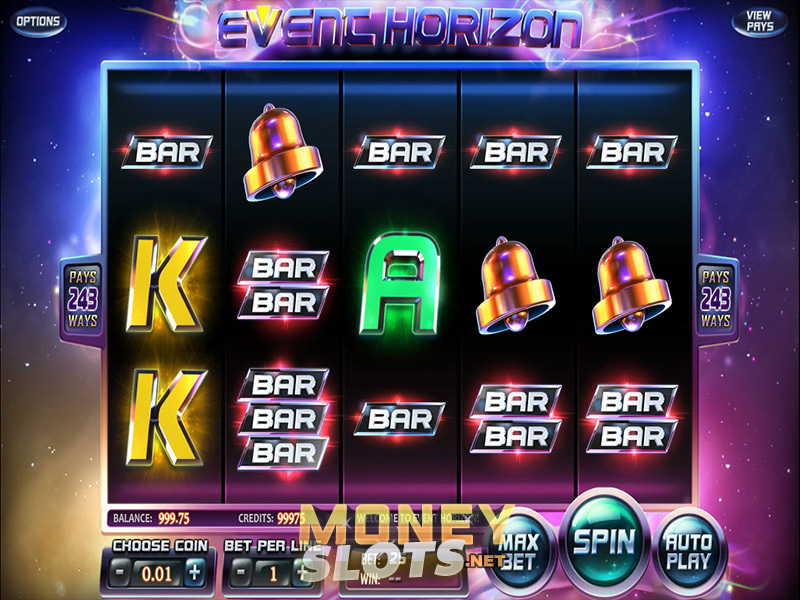 Rolled out on desktop and mobile in April 2015, Event Horizon is another thoroughly impressive slot game from BetSoft Gaming which takes casino gamers on a trip to the very end of our universe. Played at five reels and 243 winning ways, the game does not contain any bonus rounds or Free Spins features, but it does offer very good value for money due to the cloned reels perk that is active on each and every spin. The outer space background packed with various planets, stars and other celestial objects creates a nice gaming atmosphere, although the symbols appearing on the game screen are not as exciting. Besides those boring high card icons that do look a bit more appealing than usual, you will also see one bar, two bar and three bar symbols, lucky sevens and bells, with planet Earth acting as the game's only special icon. This is one of just a handful of BetSoft slot games that features the 243 way wins format, which means symbols pay anywhere as long as they are on adjacent reels. Gamers have access to decent array of bet values, with coin denomination ranging from $0.01 to $0.25 and bet per line being anywhere from 1 to 5. Max Bet and Auto Play are available, whereas numerous other selections can be made by pressing the Options icon located in the top left hand corner. Get Earth Wild to appear anywhere on the game screen and it will complete winning combos where possible by substituting for all symbols w/o exceptions. Every time you spin the reels, between two and all five reels will become synced, meaning that these will contain identical symbols. This is a great way to improve your winning chances as you don't need to unlock any special features for this to happen. Event Horizon is also available on BetSoft's high-quality ToGo mobile platform, allowing casino players on tablet and smartphone to enjoy a highly rewarding gaming experience on the move and fight for a chance to land up to 144,000 coins. The Sync Reels feature not only looks quite impressive on your handheld devices, but it also occurs on each and every spin, turning up to all five reels into each other's clones, thus seriously improving your chances to turning a profit.